For Valentines day, I showed some very romantic paintings, and gave a painting workshop I called Muse. 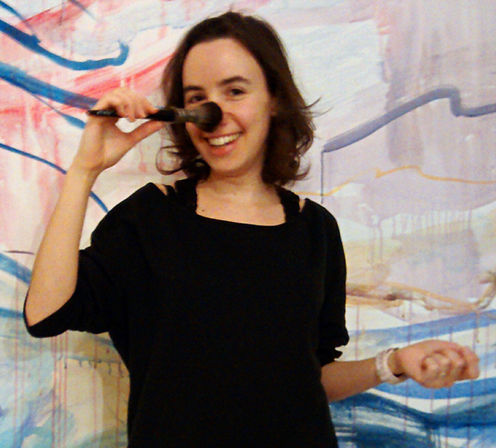 We had a wonderful model, posing in a Henri Matisse inspired setting. See photos of ‘Muse’ at Rijksmuseum Twenthe. This entry was posted in Uncategorized on June 27, 2015 by Suzanna Treumann. Besides creating and exhibiting my art, I’ve always enjoyed teaching very much. 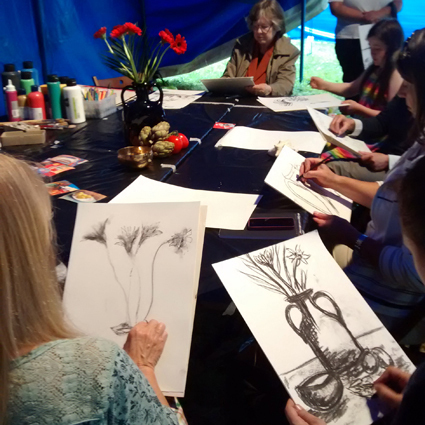 It’s a way to share the joy of the art making process: to be a witness of the creative process and offer guidance to people and simplify things, offer short cuts out support them in gaining the necessary experience they need to achieve what they envision. It’s a way for me to free my art process, and share my insights with others. 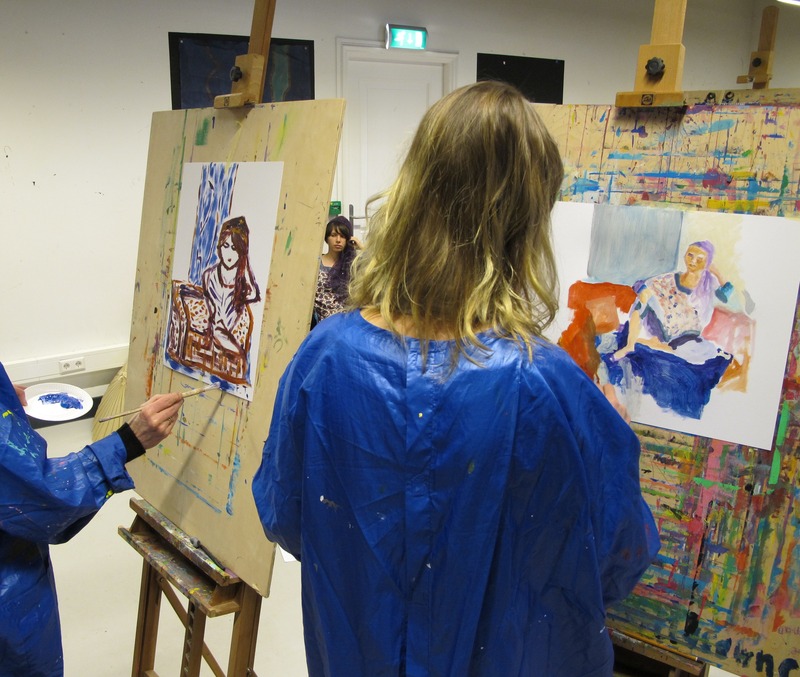 My first teaching experience was in 2009 at the Aki, academy of fine arts, in Holland. There, I would teach how to create volume, mass, to look for the proportions. And very importantly, to look longer at and better at what you see before you than the schedule that you have in your mind, which gets in the way. I had models pose who were experienced and would often have them posed in slightly twisted positions. Students brought their own materials and were encouraged to try mediums that suited them better, and to experiment. The emphasis was on practice and progress. I enjoy it when I can simplify the process of painting and teach children or adults, for example to have them create a painting in two hours. With the right set up, there is the possibility to enter the class with no experience and leave the class with a painting worth framing and hanging in your home. For more advanced classes, we go into the details of how to improve your work, considering the specific issues your way of working brings along and what drives you, inspires your work and what makes it ‘you’. Also, there is room to experiment, in order to free the work from the former ‘you’, an identification with a style or a theme when you feel that it stands in the way of your development. For information about my classes, send me an email and I will get back to you. I was a life drawing teacher at the Academy where I studied conceptual art and then painting and drawing: Aki ArtEZ in Enschede, in the Netherlands. After graduation, I worked at Rijksmuseum Twenthe as a multilingual Museum guide and teacher for two years, teaching all age groups and giving tours through a great variety of exhibitions. The Middle Ages, impressionism, portraits by Gainsborough, Dutch landscapes, abstract American painting, contemporary art; you name it! I also designed combinations of a tour and a class, so we could look at paintings, learn from them, and then start painting in the studio in the museum. This entry was posted in art classes on June 27, 2015 by Suzanna Treumann. I will write a post about this topic soon (by November 15th 2017). Some had painted before, for some it was the first time painting with acrylics. 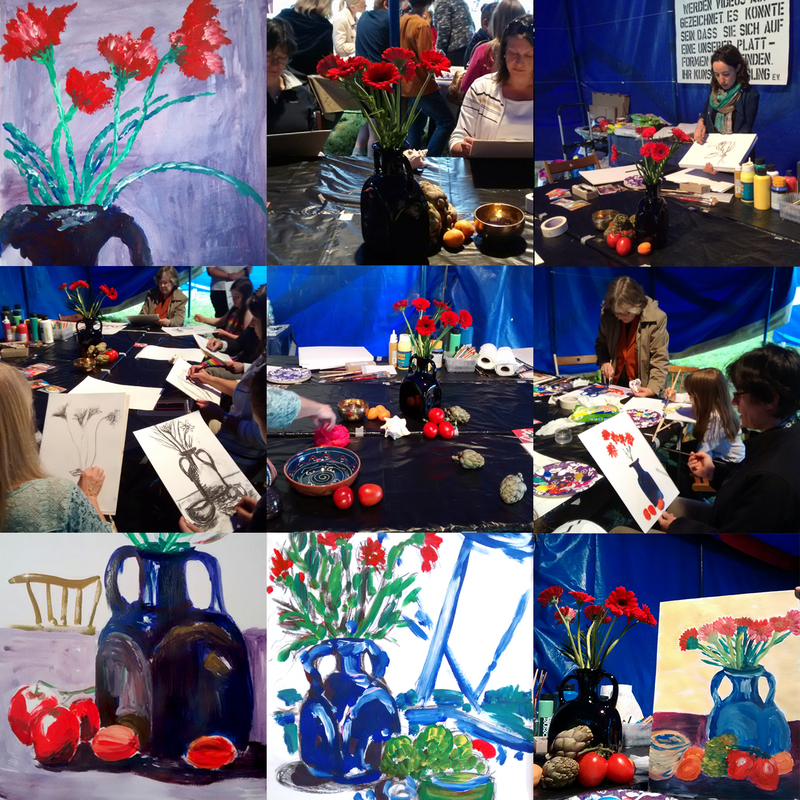 Just in two hours they arranged, sketched and painted their still life! This entry was posted in art classes on June 22, 2015 by Suzanna Treumann. We will look at reproductions of still lives as a source of inspiration. Participants are then invited to each select an object and place it on the table until we have created a enticing still life. We then look at it from different angles, and everybody picks a seat from which they can see the object(s) they want to depict. We then try out different sketching and painting techniques to create a unique work of art. Mal-Workshop: Stilleben Von der Künstlerin werden verschiedene Objekte für ein Stilleben mitgebracht. Inspiriert von Kunstpostkarten mit gemalten Stilleben, wählt jeder Teilnehmer einen Gegenstand aus und platziert diesen so auf einem Tisch, dass ein verführerisches Arrangement entsteht. Anschließend betrachten wir den Aufbau aus verschiedenen Positionen. So findet bestimmt jeder Workshop-Gast seine persönliche Lieblingsperspektive, aus der er sein eigenes Stilleben in diversen graphischen und malerischen Techniken gestalten kann. This entry was posted in art classes on May 29, 2015 by Suzanna Treumann. Suzanna Treumann is an expressionist painter from the Netherlands. In her paintings and drawings, she walks a tightrope between abstraction and figuration, displaying a broad range of sentiments. Karen Frankenstein-Lohman: Professional work as an opera singer. Becky Huening: Experiences working with a residential treatment center for women/teen girls with eating disorders. 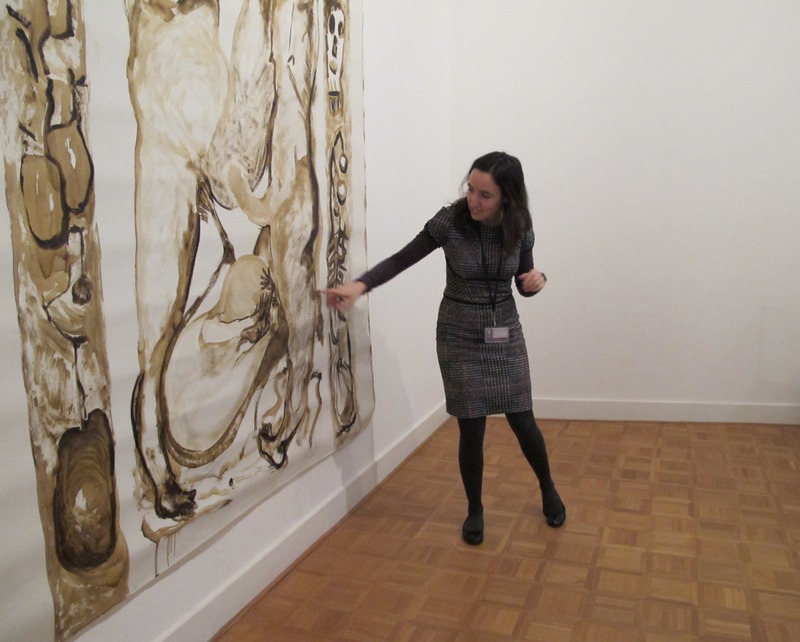 This entry was posted in art classes, Artist talks on May 29, 2015 by Suzanna Treumann.